A final year student of Banking and Finance of Auchi Poly (Polytechnic), was nabbed after she reinvented a new way of cheating during last week Wednesday’s examination. 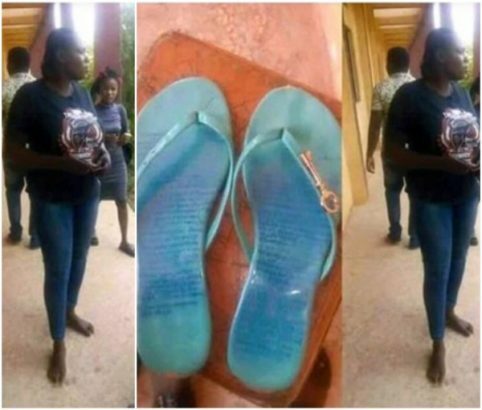 According to online sources, the Auchi Poly final year student of who was caught by a lecturer identified as Ganni, had potential answers written on the slippers she planned to cheat with. This follows up report of a Nigerian Professor who was caught cheating in an examination. It was gathered that the University of Jos (UNIJOS) suspended one of its academic staff, who was allegedly caught cheating while writing an examination on May 4, 2016. Benedicta Daudu, an associate professor of law and former head of the Department of Jurisprudence and International Law of the Faculty of Law in UNIJOS, was allegedly caught copying from a prepared answer during an examination for a Master’s degree in Research and Public Policy in the Faculty of Social Sciences of the same university. After the report, Mrs. Daudu’s membership of the Presidential Advisory Committee against Corruption was immediately suspended. Insiders at UNIJOS told PREMIUM TIMES that the lecturer has been suspended from work, and from the masters programme.